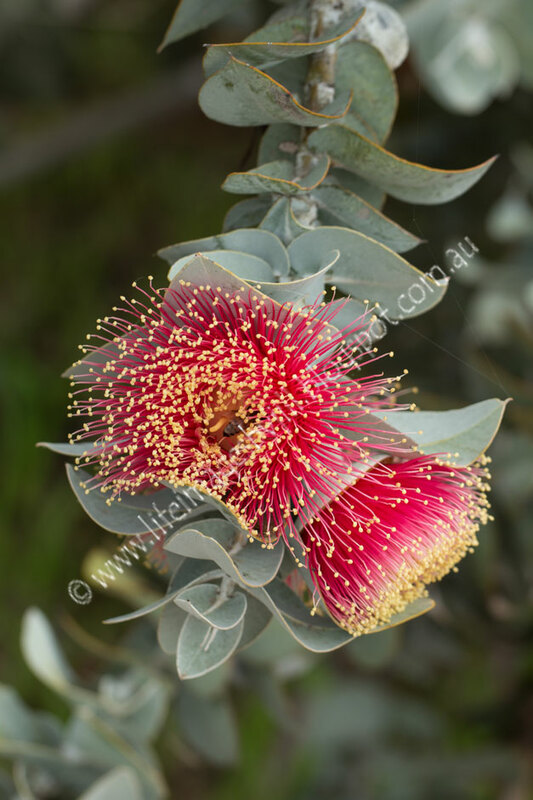 The Mottlecah - Eucalyptus macrocarpa - is a mallee eucalypt and one of my favourite Western Australian native plants. There are over 900 species of eucalypts in Australia, which have adapted to nearly every kind of environment. I am always excited if we come across a Mottlecah on our travels through the Western Australian wheatbelt. The name Mottlecah comes from the Aboriginal Noongar name Mottlecar. 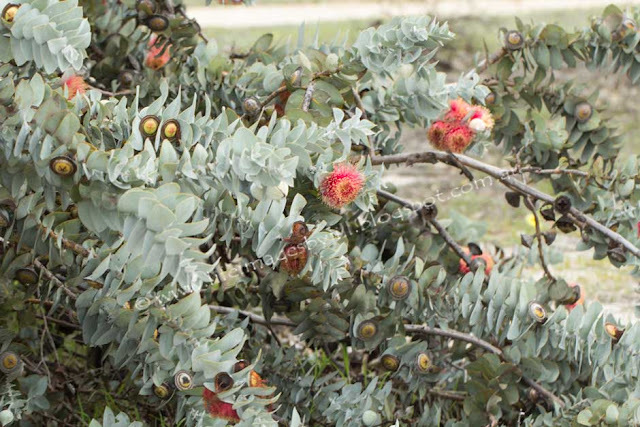 The Mottlecah is easily identified in the bush. It is a straggly sprawling bush/tree which grows to between 1-5 metres tall with thick, flat, silvery-grey leaves 5-8cm long and 3-6cm wide. 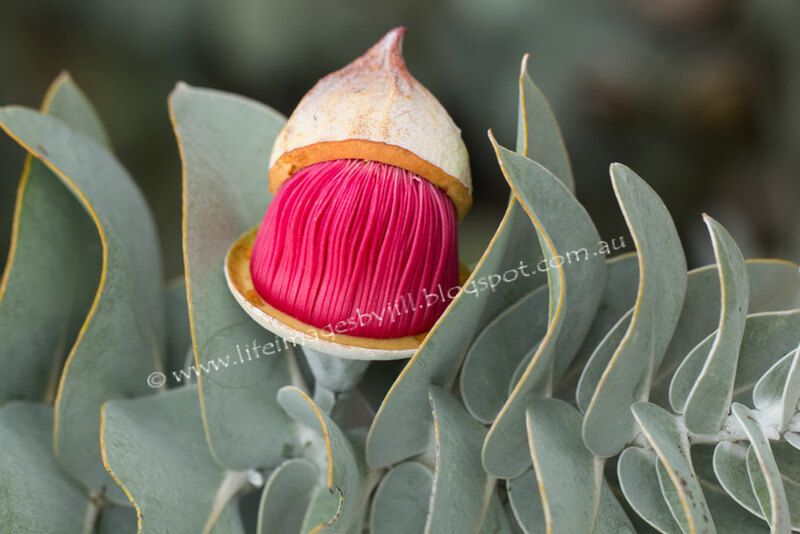 The red flowers are 5-8cm across, with a silvery cap before flowering which occurs in early spring to summer and from late autumn to early winter. 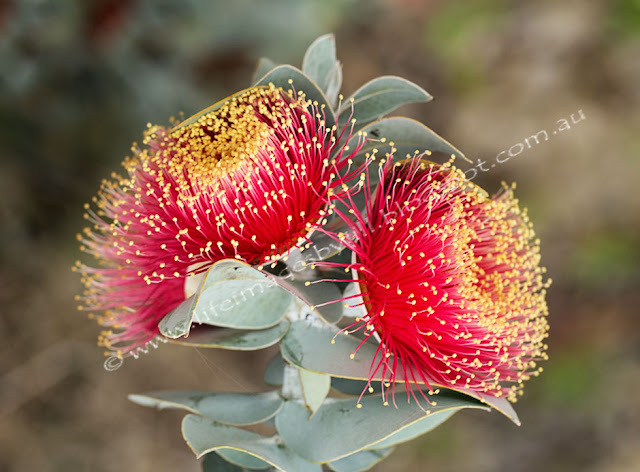 The colour comes from the stamens alone, as the flower does not have "petals". Below here you can see the flower starting to push off its cap. 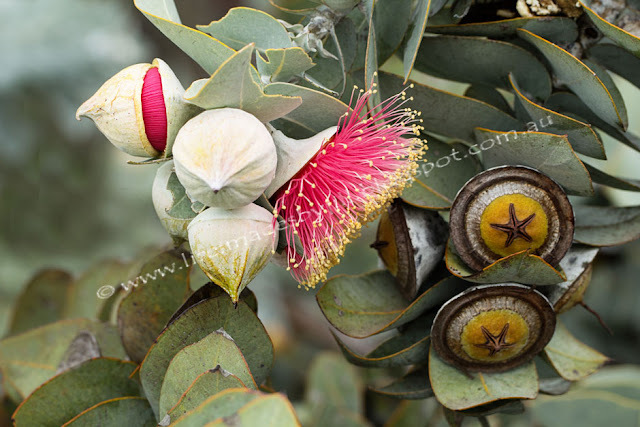 The flowers are followed by large bowl-shaped "gumnuts" which give rise to the Greek-derived specific name macrocarpa – "makros" (large) and "karpos" (fruit). You can see the various stages in the image below. Found in the wheatbelt of Western Australia, we saw them at Western Flora and also in the Corrigin region of the central wheatbelt. North of Enneabba, Western Flora is a great place to stay for a few days if you are interested in wildflowers as they have several wildflower walks you can explore. If you are visiting Perth and don't have time to travel afar, then you can see the Mottlecah in Kings Park Botanic Garden right in the centre of Perth. 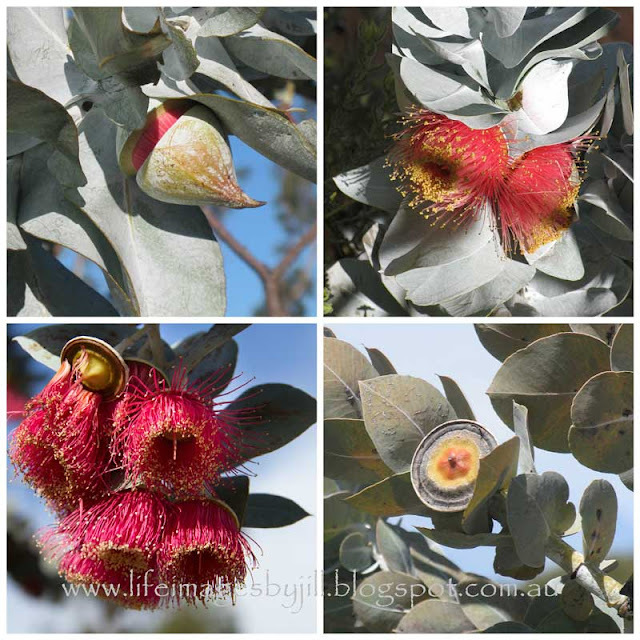 Western Australia boasts up to 12,000 known species and the Western Australian wildflower season spreads over several months starting from July in the north’s Kimberley region till November in the south. Do you have a favourite wildflower? Perhaps you would like to tell us about it in your comments. Jill - the mottlecah is an intriguing plant. Both the flowers and the gumnuts are attractive. Can you eat the nuts? My favorite wildflower is bear grass. The individual plant is gorgeous in its own right; when you have a slope full of them it is nothing short of stunning. Thanks for linking up to Mosaic Monday! About your reply: Now we're living on the country side, I have severely slowed down on traveling for special purchases (even though I miss these outings), since our weekly grocery trip takes 5-7 hours. 5-7 hours to do grocery! gosh! a once a month trip? Those are just amazing blooms! They don't even look real! BUT...there is nothing more beautiful than what we find in nature! Wonderful... Happy MosaicMonday... I enjoyed your Post. Jill, Thanks for sharing this great flower. It is amazing as it comes from its hard shell. Thanks for sharing and have a great week. Sylvia D.
and so lucky in the south west with these amazing unique wildfloers! Exquisite captures Jill. Thank you for sharing. we have many eucalypts whose flowers look similar, but this is certainly one of the largest. Truly exquisite. Love the photos! I'm am aussie too, living on the east coast. We are page buddies at Random-osity this week. Such a beautiful flower. Thanks for sharing! You always post such interesting things. I love it! Have a great weekend. Can't wait to see what you post next week. Beautiful pics. My fave is easily the photo of the gumnut emreging. Interesting as well as beautiful.